Thorongil and his men worked efficiently, quickly clearing away the scattered rubble. A few days previously, a hurricane had struck Gondor and left a good deal of damage to both crops and buildings in its wake. A few days afterwards Thorongil and his men had been summoned to assist the Captain General repair the damage to the outpost at Osgiliath, a task to which some of them applied themselves to with less that than their usual enthusiasm. "We are soldiers, not builders!" grumbled Alcarin, a recent recruit. "A soldier must apply himself to many tasks," said Thorongil. "Fighting the enemy is futile if we do not maintain our defences." "This place feels cursed!" young Ragnor exclaimed as he filled a bucket with broken stones. Just then, the Captain General walked past. "Watch your tongue, boy!" Denethor snapped. He rebuked the young man sharply. "Captain Thorongil, your man needs a severe reprimand for lowering his fellows' morale." "Some words are best spoken in private, Ragnor," said Thorongil mildly. "Yes, sir, I'm sorry, sir." "Those are not regulation boots, boy," Denethor barked, staring at Ragnor's feet. "You should be flogged, boy, for insubordination!" "If any should be punished, it is I," Thorongil said calmly. "He has blisters on his feet and I gave him leave to wear the more comfortable boots. I wear the emblem of my folk upon my tunic, by leave of the Steward, so I am flouting regulations too. You can flog me if you wish, but I doubt your father would be best pleased with you." Denethor glared. "You are too soft with your men, Captain Thorongil," he replied. "They will all be asleep on feather beds when the enemy attacks, the way you coddle them!" "My men have routed the enemy in each battle we have fought," said Thorongil. "There is nothing more you can do here," said Denethor. "Take your men and return to the City." He abruptly turned away and stood for a moment staring at the ancient ruins of the Dome of Stars. "Alas, my beloved land, your glory has fled!" he said in so soft a tone that even Thorongil's sharp ears only just made out the words. "Men, leave off your tasks and gather round!" Thorongil called. "Thank you, Captain!" said Ragnor as the men flocked to Thorongil's side. He still looked rather whey faced. Flogging was a punishment that every soldier dreaded. "Don't fret about the Captain General, lad," said Thorongil, squeezing the boy's shoulder. "What you said unwittingly touched a raw nerve in him. No true Son of Gondor likes to see what has become of this once great city, and especially not the Steward's heir. Many of us feel as you too, but we have learned to keep our thoughts to ourselves. This City with its great Dome of Stars and the throne room was one of the wonders of the Age." "You know more of our history than many who were born and bred here," said Ulfast, a greybeard and veteran of many a battle. "Lore has always interested me since I was a boy," said Thorongil. "Now listen, men! The Captain General has given us leave to return to the City. Gather your belongings. We leave in a few minutes." Thorongil and his men thankfully left the ruined city and its garrison behind them. They were soon marching through fields of barley in the countryside. Much of the grain had been devastated and flattened by the hurricane and was a sorry sight to behold. The men helped themselves to the occasional ear and chewed on the grains. Thorongil collected a fair quantity as he marched along. "Are you planning to brew us some beer, Captain?" asked Ragnor. "You are not that fortunate!" Thorongil replied. "Barley is an excellent remedy for a fever or an upset digestion, so I am replenishing my healing supplies while I can." Ulfast playfully cuffed the boy and laughed. "You are a man of many talents, Captain!" he said. "A good captain needs to be, so I was taught," said Thorongil. "You had good teachers then?" "I had the very best," said Thorongil. He turned his attention back to the barley. Ragnor, who was gifted with a pleasant tenor voice began to sing "Heedless of the wind and weather, Gondor's soldiers march together. With Thorongil, our Captain bold, our deeds will match the tales of old!" "Don't let the Captain General hear you singing that, lad," said Ulfast. "All the soldiers sing it," said Ragnor. "I didn't make it up." "Maybe it was the men in the troop the Captain led before us?" mused Ulfast before enthusiastically joining in the song. Thorongil paid no heed to what his men were singing. Instead, he continued to gather healing supplies. The men marched on until the fields of barley gave way to lavender fields. 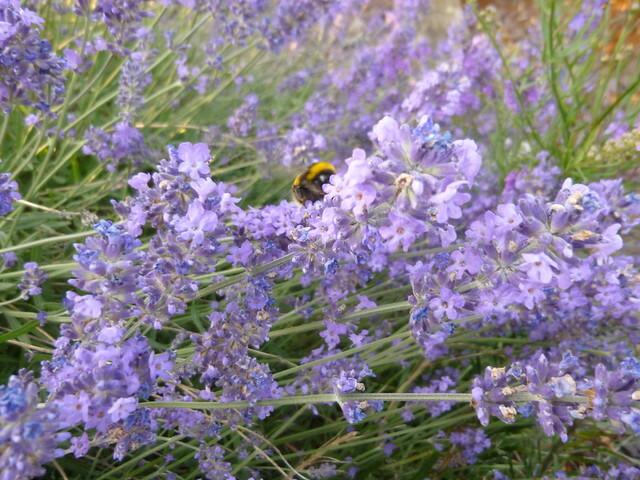 The lavender was fair to behold and the farmers usually made a fair profit selling the crop to make perfume, honey, and tea. The sun came out, as they approached the purple flowers, bathing them in pleasant warmth. Again, the crop had been damaged by the hurricane, but the sweet scent, together with the array of colourful butterflies fluttering amidst the flattened crops, gladdened all their hearts. Thorongil added some lavender to his healing supplies alongside the barley. It had many uses; to cleanse and soothe the skin and promote restful sleep, being the most frequent. Thorongil called a halt. "We will rest here for a while," he said. "There is a stream nearby where you can drink and refill your water bottles. And those of you with mothers, wives, or sweethearts could gather a few sprigs of lavender to press and enclose with your next letters home." He went down to the water and splashed some on his face before drinking deeply and re-joining his men. Most of them were sitting at the edge of the field talking amongst themselves and nibbling at their rations. Ragnor and Alcarin were play fighting amongst the lavender, tussling like a couple of puppies as they rolled over, playfully dodging each other's half- hearted blows. Thorongil sat on a bank at the edge of the field and watched them, amused by their antics of youthful exuberance. In the few short months since he had been given this troop to command, he had come to love these men almost as brothers. He knew they would gladly give their lives for him while he would do the same. He was seized by a sudden pang. He had been loved and cherished during his childhood, but there had been no one with whom he could playfully tussle in the grass with until he had come of age and met Halbarad. How he missed his kinsman! He closed his eyes and was immediately back in Rivendell, watching his mother gather lavender from the gardens. Always she had wanted to be useful and begged Master Elrond for some task that she might perform. Another vision swam before his eyes, of Arwen wearing a lavender gown, which complemented her grey eyes to perfection. She had smiled at him that day and asked him to walk with her in the gardens, which had given him a glimmer of hope that she might not be indifferent to him. Suddenly, his foresight came upon him and he beheld an older version of himself playfully wrestling with a man who looked alike to Denethor, but yet was not he, together with a small boy, whom he somehow knew was his own son. Arwen was watching them, her eyes filled with laughter. He let the young man and the child overpower him then scrambled to his feet. Arwen embraced him and their lips met. "Captain, are you well?" Ragnor's concerned young voice jolted him back to the present. "Yes, I was just lost in thought." "You had a look of ecstasy upon you, such as one sometimes sees in dying men!" "I assure you I am not dying!" Thorongil smiled at the boy. "I was thinking of someone dear to me." "Ah." Ragnor gave him a knowing look. "Be off with you and gather some lavender to send to that fair maiden in your village you told me about," said Thorongil. "We must be on our way soon." "Yes, Captain." Ragnor hastened to do his bidding. Thorongil rose to his feet and gathered several more sprigs of lavender. He would enclose them in a letter to his mother and ask her to give one to Arwen as a token of remembrance. One day, he would win her love.